Note: This post was originally published on Nov. 6, 2016. 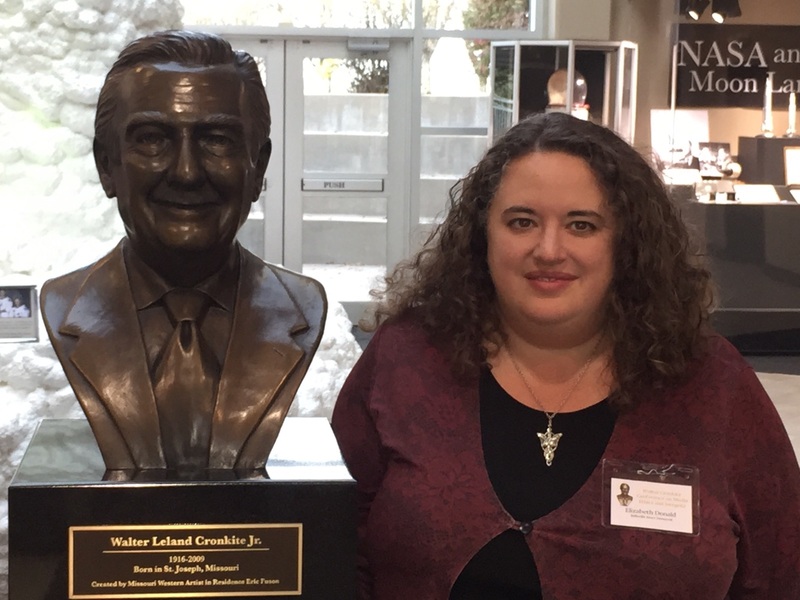 This weekend I had the privilege of speaking at the Walter Cronkite Conference on Media Ethics and Integrity. 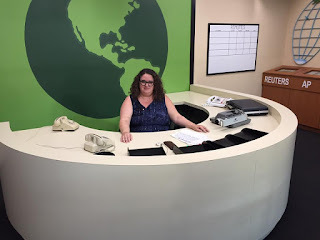 I was pretty nervous, as I’d never done an academic conference before – SPJ conventions, guest speaker at local universities, and of course, cons. No one at the Cronkite Conference was dressed as Pennywise the Clown, however. Somehow I missed that the conference was scheduled to coincide with Cronkite’s 100th birthday, which was celebrated at the Walter Cronkite Memorial on Friday along with the unveiling of Phase IV of the memorial. We were treated to an amazing three-act play developed by the memorial staff titled “And That’s the Way It Is: Cronkite’s Journey.” This show has been taken on the road and performed all the way to D.C. If it is ever in your area, you owe it to yourself to catch it. Actor Jim Korinke does a spot-on Walter Cronkite, and the gentlemen playing Harry Truman and Martin Luther King Jr. are pretty amazing themselves. 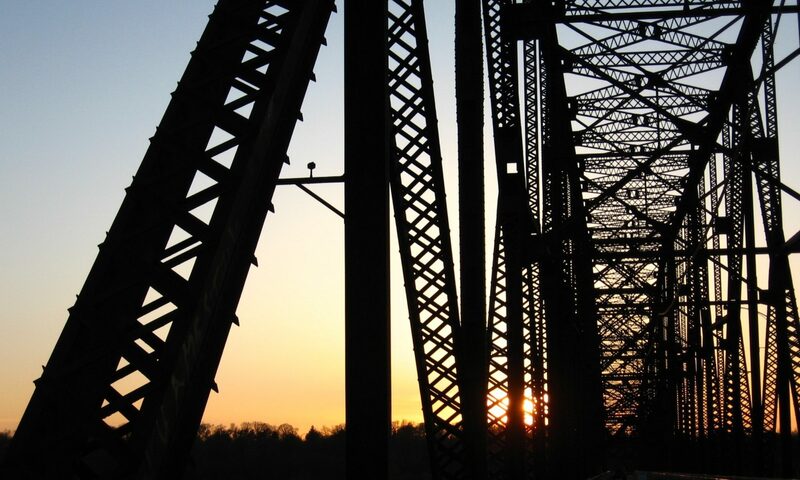 Act One focuses on Truman and Cronkite’s lives in parallel from 1945 onward. It is a little gentler on Truman than history has been, but more true than some of the biopics have been. Act Two focuses on King and Cronkite through the civil rights movement, including the ethical and practical issues faced by the CBS news team as they tried to cover the movement with dispassion. I did not know, for example, that simply covering the movement was seen as “championing the blacks” and that southern affiliates threatened to cut their affiliation with CBS – which would have bankrupted the network. Unfortunately I missed most of Act III. Damn news. I was reporting on a story back home by remote, and got some information during the intermission. I was still updating the story from my laptop when Act III began, and once I was done, the doors were locked and I couldn’t get in until someone came along who had a key. Rats. Jim (who was verklempt throughout the performance) reports that it was a representative of Cronkite’s question-and-answer on Larry King Live on the one-year anniversary of 9/11. I would have liked to have seen that. I only caught some of the presentations at the conference, but those I caught were fascinating. Check out the Twitter account @edonaldmedia if you want more specifics. I met a journalist named Deandre Williamson of the Bahamas, who won the award for having traveled the farthest (unless it’s farther to Chile? Maybe.). Williamson discussed the evolution of the media in the Bahamas, which does not have freedom of speech, and its recent adoption of the SPJ Code of Ethics a few months ago. It faces an uphill battle there, and I enjoyed discussing those issues with Deandre. Pic taken by my long-suffering husband, who agreed to come to a journalism ethics conference on our anniversary. My presentation was on the 2014 revision of the code, and it must have gone off well, since no one fell asleep, walked out, or threw rotten tomatoes. Big thanks go to ethics chairman Andrew Seaman for giving me his terrific PowerPoint, which I then adapted to my speech. The last time I used PowerPoint, I was in college. That was a while ago. Thanks to the Kansas City Press Club, which invited me to speak. And thanks as well to former chairman Kevin Smith, who shared some of his thoughts and recollections with me as I prepared for the presentation. Kevin herded the cats through our entire process, and survived. 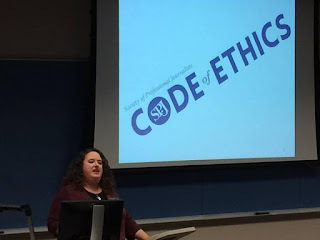 I’ve often said that my participation in the ethics commission and the small part I played in rewriting the code are among my proudest accomplishments, and thus it was no small thing to be asked to talk about it – here at the conference, at local universities, at SPJ conventions, at high schools, on a milk crate at a street corner. Kevin called it “spreading the Gospel”; I’ve sometimes called it “evangelizing ethics.” As I said in the speech, there are far too many people who don’t even realize the code exists, and that’s because we do a lousy job of transparency in our work. We must stop expecting that the average reader knows how a newsroom functions, how news corporations work on the inside, about the difference between news and opinion, and the presence and enforcement of ethics codes. Sometimes I’ve felt like the lone voice crying in the wilderness. This weekend I was among My People, and it felt wonderful. It was good to know I am not the only one who is disheartened and depressed by the vitriol we face as we try to do our jobs. I learned a lot from my fellow journalists this weekend, and about Uncle Walt, whom I thought I already knew well. Cronkite retired before I was old enough to really comprehend the news, but when I was young and would hear my newsman father refer to “Uncle Walter,” I thought at first we really had an uncle named Walter. Dad was a big fan of Cronkite, and after you visit the memorial, you will be as well. From World War II to the Kennedy Assassination to the civil rights movement to the moon landing to facing down Spiro Agnew, the story of Cronkite is really the history of us for the last sixty years, and it’s worth your time. If you do, you get to wear The Glasses.